Support for military families can come from all sorts of places—even softball fields. 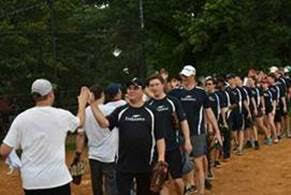 On July 30th, 12 teams of insurance/reinsurance professionals from various companies came together in Central Park to play in the Insurance Industry Charitable Foundation’s (IICF) annual softball tournament. Even the rain didn’t put a damper on this event, where teams still raised $50,000 for Our Military Kids—a very special charity which provides grants and support to hundreds of children with parents deployed or injured in the military. The proceeds from IICF’s event went toward fees associated with athletic, fine arts, and tutoring programs for these children. 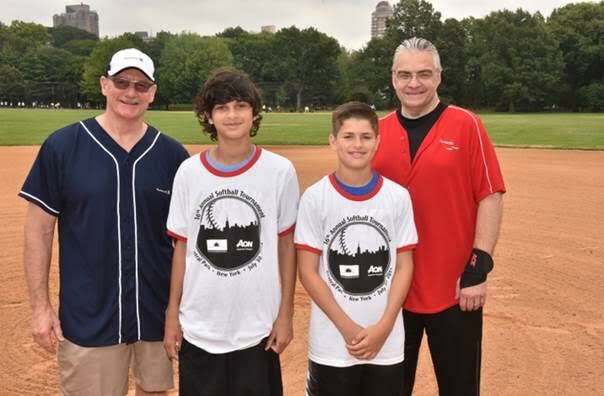 Two of the children, ages 13 and 14, threw out the first pitches at the event. The boys’ father is currently deployed in the Middle East, and they both received grants made possible by IICF’s tournament. Insurance industry professionals came together on this day to support military children, like these great boys, in this incredibly moving day. Working with organizations like Our Military Kids, IICF provides grants, volunteer service, and leadership throughout its divisions. Since it was founded over 20 years ago, IICF has contributed more than $23.5 million in grants to charities and nearly 200,000 volunteer hours to hundreds of community nonprofits. This coming October (Oct. 10-17), IICF’s annual Week of Giving will once again bring together volunteers across the country to volunteer with local organizations and projects. With a special appreciation for serving those in our military, volunteers can partake in several projects for military families, including food distribution and participation in a project entitled, “A Million Thanks,” where individuals can write cards, letters, emails, and prayer messages of appreciation for military members, both past and present. As one of IICF’s most cherished industry events, this softball tournament united individuals from various companies to share in appreciation for those who serve our country and their children. This tournament, along with the other events IICF will host throughout its upcoming Week of Giving, continue to give back to communities and organizations such as Our Military Kids, which support even our smallest heroes.